When our clients need sound dampening solutions and do not want to sacrifice aesthetics, we recommend the Snowsound Flap Grande solution. 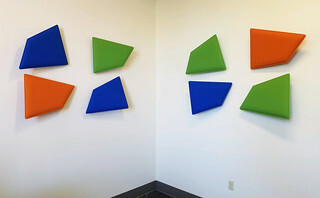 These are a non-traditional acoustic panel systems that can be placed in different configurations to create the look you want. These are a great combination of functionality and style.